I am super excited to announce a new edition of our GMAT Advanced Quant Strategy Guide! We worked hard on this book all of last year (yes, it takes a long time make a book!) and we hope that you find it to be a valuable addition to your GMAT preparation. What is the Advanced Quant guide? We created the Advanced Quant (AQ) guide a few years ago for people who want to get a top score (50 or 51) on the quant section of the GMAT. Here’s the interesting thing: it doesn’t teach you a bunch of really hard math concepts. We teach all of those concepts in our five regular strategy guides (Algebra, Geometry, Word Problems, Number Properties, and Fractions, Decimals, & Percents). Instead, the AQ guide teaches you the next level of GMAT study: how to think your way through really hard quant problems. A bunch of things! First, there are more than 50 brand-new, extremely hard problems. We actually removed some old ones that we thought were a bit too easy and replaced them with harder problems. But that’s not all. Since the entire point of this book is how to solve better, we’ve updated some solutions to existing problems because we’ve discovered an even more efficient or effective way to solve. We’ve also introduced a new organization method for working your way systematically through any quant problem. We’ve added or expanded lessons on test-taking strategies, such as testing cases on both problem solving and data sufficiency problems. One student, who has already used the old version of AQ, asked whether we would provide a list indicating which questions are the new ones. I told him no. Not because I’m lazy or I don’t care, but because you don’t need such a list! If you’ve already tried the first edition and want to try this one, too, just start going through the book. If you hit a problem you remember, feel free to skip it. (Although maybe this is a chance to see if you really do remember what to do…and remember that we may offer an updated solution that you haven’t seen before.) If you hit a problem you don’t remember, then it doesn’t matter whether it’s old or new. It’s new to you right at this moment! Who should use the AQ Strategy Guide? First, you should have mastered most (if not all) of the material in our five main quant Strategy Guides. As I mentioned earlier, we do not actually teach you that math in this guide. We assume that you already know it. As a general rule, we recommend that people avoid using this book until they’ve gotten to a score of at least 47 on a practice CAT. (Seriously. We say so right in the first chapter of the book!) I might let that slide a bit for certain students, but someone scoring below 45 likely does not have the underlying content knowledge needed to make the best use of the Advanced Quant lessons. Note that, from an admissions standpoint, you may not necessarily need to score higher than 47. The scoring scale tops out at 51, so 47 is already quite high. Do a little research to see what you may need for the specific schools to which you plan to apply. All right, that’s all I’ve got for you today. I’d love to hear what you think about the book. Which problem is your favorite? And which one do you think is the absolute hardest, most evil thing we could have given you? Let us know in the comments! 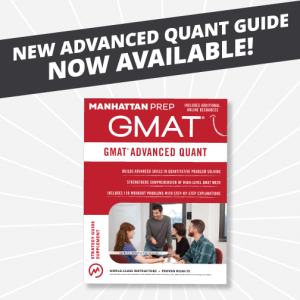 Check out our store to learn more about the new GMAT Advanced Quant Strategy Guide.